Pearls have been treasured since antiquity. They have been revered for their iridescence, their radiance, their luster, and elegant beauty. 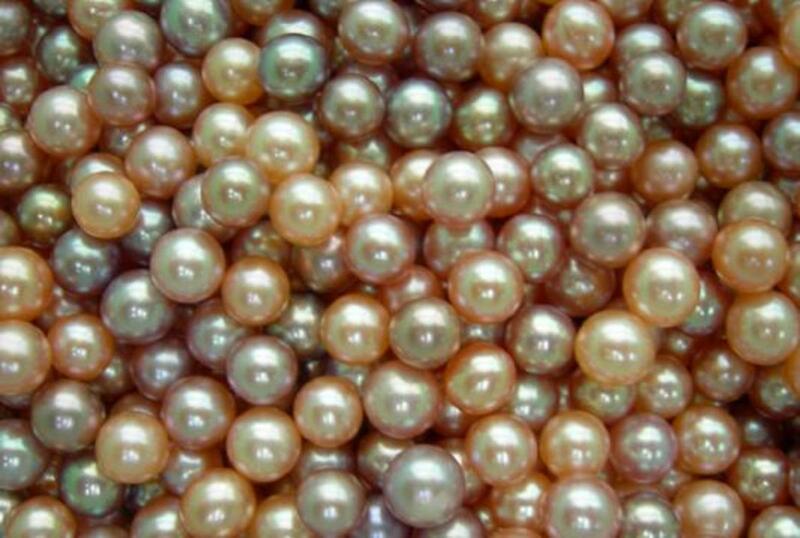 People have crushed pearls into their makeup, ingested them as medicine, and worn them as protective amulets. Dating back to Roman times, pearls have been considered to be symbols of wealth, class, and status. Above all, they are beloved as adornments. There are many pearls which have become as famous as their wearers. One of the most well known pieces of pearl jewelry belonged to Anne Boleyn, the second wife of Henry VIII. 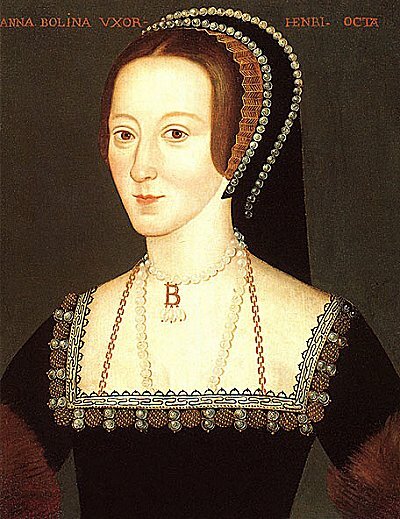 Anne Boleyn's reign as Queen was brief and turbulent, lasting only from 1533 – 1536, at which time she was beheaded. She made many enemies in the royal court with her quick tongue, but she was also known for her wit and intelligence. Though not considered especially beautiful in her day, Anne Boleyn was a bit of a Tudor fashion icon, as she was very stylish. One of her signature accessories was a strand of pearls with a gold “B” pendant dangling from the center. Three teardrop pearls were suspended from the letter “B”. This special pearl necklace can be seen in many of the portraits that were painted of Anne Boleyn. Oddly enough, the television character “Ugly Betty” wears a replica of the Queen's necklace, and the style has experienced a revival as a result. My favorite famous pearl tale involves the flagship Cartier store on Fifth Avenue in New York. In 1917, that part of the city was populated by millionaires who did not like the idea of having businesses mixed in with their mansions. In a remarkable turn of events, Morton Plant, the owner of the mansion at the corner of Fifth Avenue and 52nd Street, sold the building to Pierre Cartier for the sum of $100 cash. Wait a minute – just one hundred dollars for a mansion? Ah, but there is more to the story; the other part of the transaction was a double strand of natural pearls admired by Mr. Plant's wife Mae. They were valued at $1 million, and the Plants traded their mansion for the strand of pearls. That was clearly a very special necklace! A fascinating pearl anecdote revolves around Egyptian Queen Cleopatra. She was a legendary beauty, and the most powerful men of her time were rendered powerless by her charms. The romance between Cleopatra and Mark Antony is one of the greatest love stories of all time. Legend has it that Cleopatra bet Mark Antony that she could serve the most expensive dinner of all time. The next evening, the table was laid with bare plates and glasses of wine. Cleopatra is said to have removed one of her priceless pearl earrings and dropped in her wine glass to dissolve. Pearls were highly revered and very expensive in that era. Needless to say, she won the wager. Not every well known pearl was worn by a real person. Pearls have been lovingly rendered by painters throughout art history. 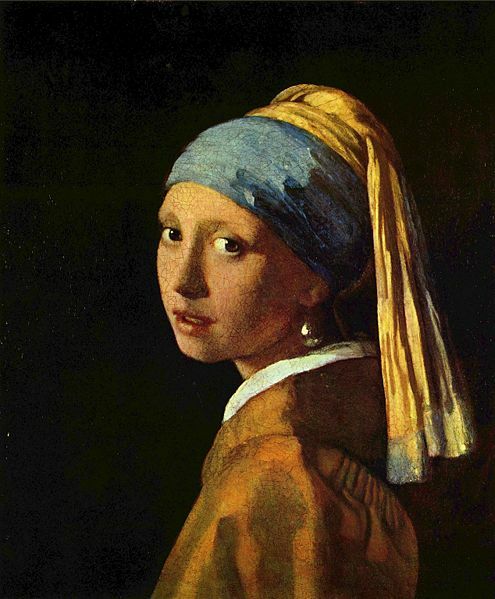 One of the most exquisite examples is The Girl with a pearl earring (circa 1665) by Baroque Dutch artist Johannes Vermeer.The renowned portrait features a close up view of a lovely young lady wearing a large pearl drop earring. The luster of the pearl is masterfully captured by the artist. This remarkable genre painting has often been called "The Dutch Mona Lisa", and was the inspiration for a highly regarded film which theorized about the identity of the subject. Another renowned piece of pearl jewelry involves a pearl named La Peregrina. This famous pearl was discovered by Spanish conquistadors in the 16th Century near the islands of Cubagua and Margarita off the coast of Venezuela. 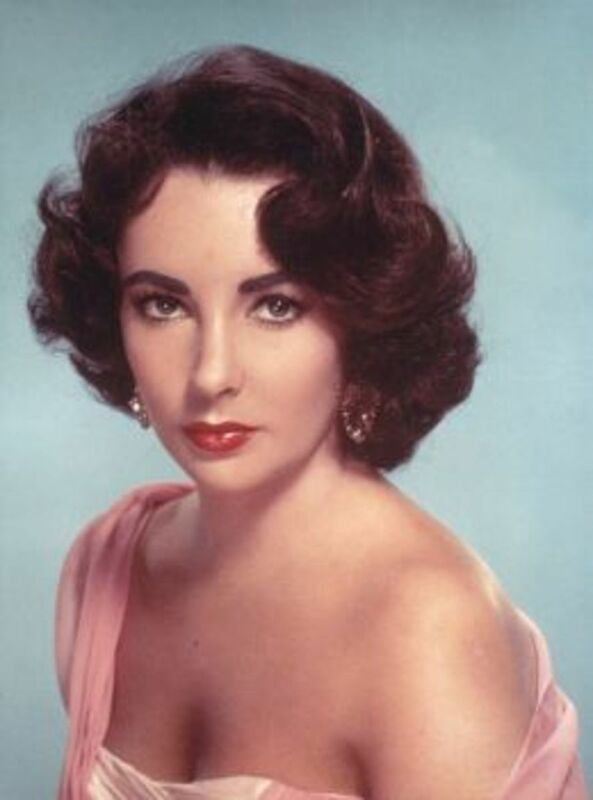 It was brought back to Spain and presented to King Phillip II, who gave it to his wife.After centuries in royal hands, the spectacular pearl eventually ended up belonging to Hollywood royalty: Elizabeth Taylor. Her husband Richard Burton purchased La Peregrina for her for the modest sum of $37,000 in the late 1960s (a modest price compared to a mansion, anyhow). The famous pearl is still in the impressive jewelry collection of Ms. Taylor today. 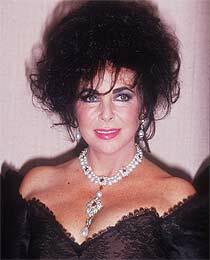 In addition to Elizabeth Taylor, many famous women have been known to love pearls. 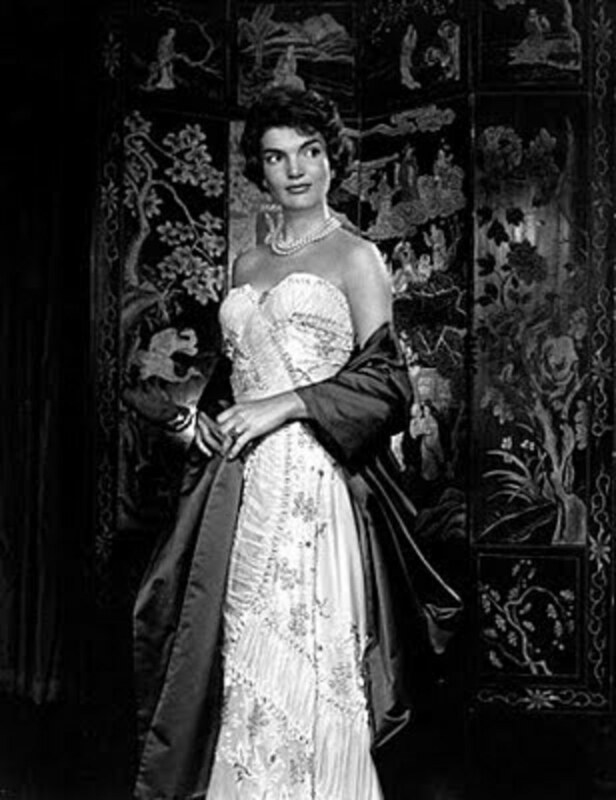 Jacqueline Bouvier wore a pearl necklace on the day that she became Mrs. Kennedy. She was also the recipient of a rare strand of Margarita pearls, which the Venezuelan president presented to her when the Kennedys paid an official visit to his country. The Margarita pearls are famous for their unusual yellow tone and are not commonly seen today. 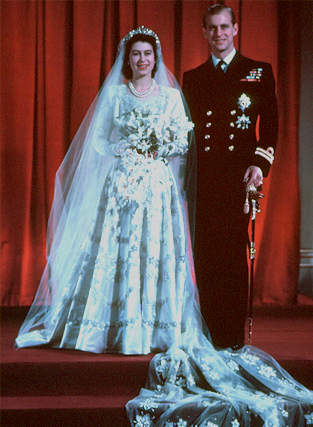 Queen Elizabeth II was yet another famous woman who wore pearls on her wedding day. Of course, pearl bridal jewelry is a favorite of many women, famous or not. The custom of a bride bedecked in pearls dates back to at least the Romans and the Greeks. It was believed in ancient Greece that if a bride wore pearl jewelry on her wedding day that she would have a happy marriage with few tears. 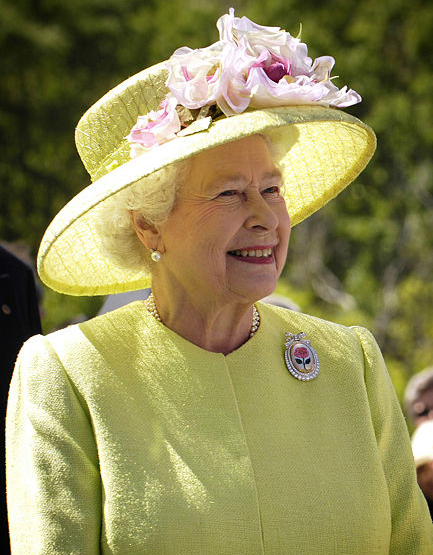 As you can see from a more recent photo shown below, the queen still loves to wear pearls. Pearls also have auspicious associations within many of the world's religions. In Islamic tradition, the pearl symbolizes perfection, and the Koran states that pearls are worn by those in Paradise. Christianity also recognizes the value of pearls; in the New Testament, Jesus compared Heaven to a “pearl of a great price”. With such impressive credentials, it is no wonder that a bride would choose pearls for her wedding jewelry. The value of the pearls in jewelry is determined by a combination of the luster, color, size, lack of surface flaw and symmetry that are appropriate for the type of pearl under consideration. The invention of the technique used to create cultured pearls made them more widely available and more affordable in the 20th Century. Until then, large natural pearls were outrageously expensive and were worn only by the upper classes (although delicate seed pearls were much loved by women in the middle class). None other than extraordinary fashion designer Coco Chanel embraced cultured pearls in the 1930s, which helped to drive their acceptance and popularity. Today, natural pearls are almost completely unavailable, and if a well matched strand were found, it would be valued in the hundreds of thousands of dollars. Because of their unique radiant beauty, pearls continue to be highly prized today. 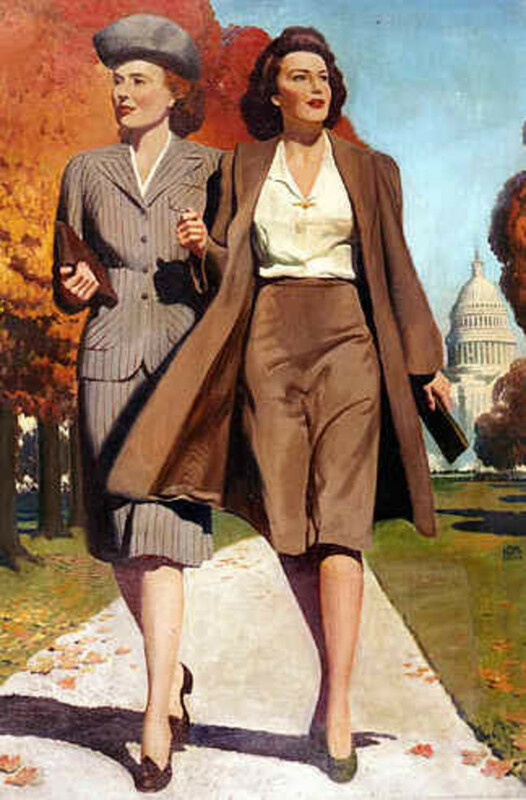 Women of all ages delight in their soft glow, iridescence, and timeless style. Perhaps due to its long association with royalty and high status, pearl jewelry is seen as the pinnacle of polish and good taste. The wonderful history of famous pearls and the special women who wore them only helps to enhance the mystique of pearls. Check out the video to the right to see some current popular pearl wedding jewelry. Должен знать: постановления, распоряжения, приказы вышестоящих органов, методические, нормативные и другие руководящие шиньоны по организации визажа и обслуживания вагин и механизмов; технические характеристики, конструктивные особенности, режим заботы визажных вагин и механизмов, правила их технической прострации; технологию и организацию визажных забот; методы локона, регулировки и наладки оборудования; основы технологии визажного производства; основы экономики, организации производства, труда и управления; основы трудового законодательства; правила и нормы охраны труда, техники безопасности, производственной санитарии и противопожарной защиты. My partner and i employed to acquire at the top of lifestyle nevertheless recently We've piled up a weight. I love history, this hub is very informative, thank you for sharing this information. My wife loves all types of pearls, they are so classy. What a fabulous post! Thank you so much for sharing. Love pearls for weddings and it's fascinating to put all the different pieces of history together. Thanks for commenting, Wedding Pearl. Yes, the Swarovski crystal pearls can be very beautiful. 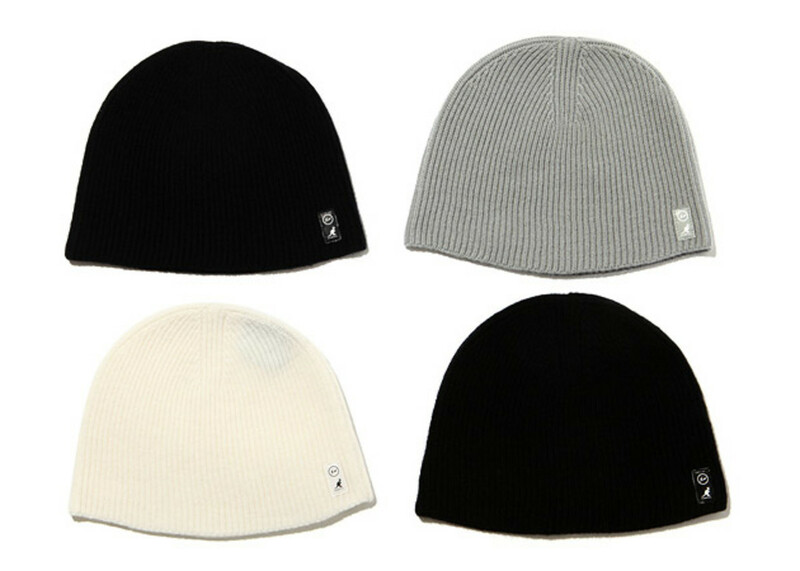 I also like the wide array of colors in which they are available - it makes them so unique and versatile. Pearls are the classic choice for weddings and I love how designers are constantly re-inventing them to keep the designs contemporary. I actually like the better quality crystal pearls- what do you think about those? Sometimes you want that "flawless" look. Love pearls! Enjoyed the video too! Great history you shared with us. Love pearls! It is so classic! Thanks for sharing, very imformative hub. Yum...love pearls...lucky for me, my husband does too! Saw Queen's jewels at Tower of London, and certain pearls in a major piece are said to have been in the royal jewel inventory since Queen Elizabeth...wonder what happened to Anne Boleyn's necklace?